After the original material premiered in the 1980s off-Broadway, Falsettos had its Broadway debut in 1992, playing for a little over a year before closing in June 1993. 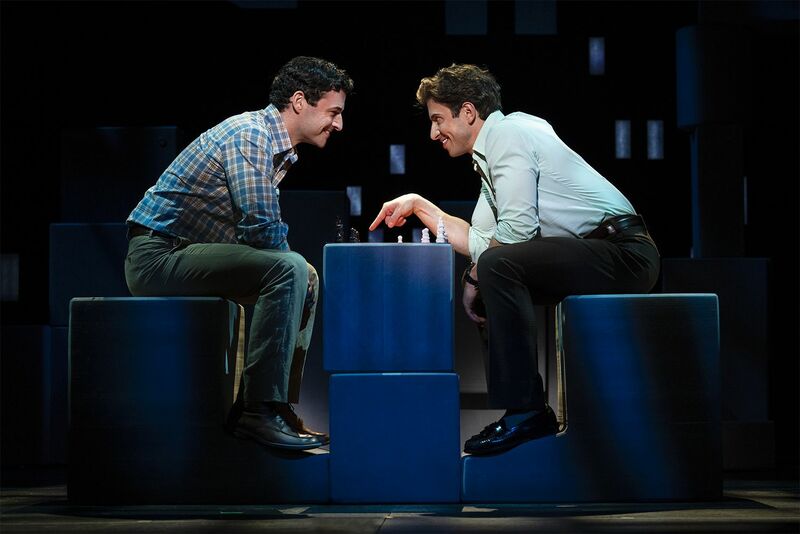 It wouldn't be revived again until original director and book writer James Lapine restaged it at Lincoln Center in 2016, earning Tony nominations for stars Christian Borle and Andrew Rannells, as well as for the revival and featured actors Brandon Uranowitz and Stephanie J. Block. SFist sat down with von Essen, who plays Marvin, and Adams, who plays Whizzer, to talk about what the show and this extraordinary production mean to them. Also I wanted to know if they learned anything from meeting Tony-winning composer and lyricist William Finn who attended the San Francisco opening, and what their favorite song in the show is. Jay Barmann, SFist: After all the buzz around the Lincoln Center production, were roles in this tour in especially high demand among your peers? Max von Essen: Yes we beat out virtually everyone. [laughing] It seemed like it. The show was on your radar for a lot of your life [pointing to Adams] but it wasn't really on mine. But then when I saw the revival I was hooked on the show and hooked on the idea of doing it. And I'm finally the right age to play Marvin. I really connected with the show seeing the revival, and seeing Christian Borle as Marvin, and I remember calling my agent and being like "Keep an eye out, if they're doing a tour." Nick Adams: I knew the show, and I knew the score from college — because any bari-tenor was singing the score. And so I loved the music first, and I always kind of hoped someday I might get to play this role. Then I was on tour in Wicked with Alison Fraser who was the original Trina, and she knew ahead of time that this was going to be revived. She said to me, "You are Whizzer. You have to play this role." I called my agent and it turned out Andrew [Rannells] was already part of the package deal — that cast was already constructed before it was even happening. After I saw the revival I was just like, "I have to play this role." I know that every one of my peers who I usually go up against for roles were going after this part [in the tour]. The team actually called me to do a promotional concert for the tour in Chicago, where I sang "What Would I Do?" with Tally Sessions who was one of the understudies in the revival. After that, friends of mine were contacting me like "Did you already book this or should I still go in?" And I was like, "Maybe you shouldn't go in." [laughing] Because of the pedigree, and the fact that James [Lapine] was going to be setting this on the road, and this revival was so celebrated... it was very competitive. MVE: And these roles are just so good. It's like being in an ensemble of all principal characters. JB: Even the kid has a lot to sing. NA: It's a bigger role than Annie. [gesturing like a marquee] "Jason"
JB: How would you say this show compares, in terms of the difficulty of the music, with other musicals you've done? MVE: Hardest I've ever done. It's the hardest show I've ever learned. NA: The magnitude of a sung-through musical like this, all the emotion... It's a singular challenge for sure. JB: I'm no expert but it seems like those minor-chord harmonies are really hard. MVE: Each cast has taken their own liberties, but if you try to learn the show, note by note, it's almost impossible. You develop your own moments, and -isms, and there are parts where you go, "I'm just going to sing it this way." But that's great though, because you really don't want every single note to be perfectly sung. You have to make it your own and make it conversational. I haven't done much Sondheim so I don't have that to compare it to, but it's the most complex show I've ever learned other than an opera. NA: And we don't ever leave the stage. It reminds me of that style, like the revival of Chicago they did with everyone sitting on stage in cabaret chairs and commenting on the action — that was my first show out of college, and this reminds of that but in a much different way. Even when you're not active you're still acting. JB: How did you each prepare for your roles. Did you listen to any of the recordings? Did you listen to In Trousers? MVE: No, but a friend found a record and played some for us. I did listen to some recordings, and we had a very short rehearsal process. Nick came in really prepared and I came in semi-prepared. We all tried to learn as much as we could, but it was hard. We had one or two days of music rehearsal and then we were up on our feet. As you know from the show we do all the transitions and so suddenly we were being shown all the blocking and set changes. What was helpful was we were doing a show that had been staged already so I did watch the PBS recording [of the Lincoln Center Production] a couple of times and I would sit in my living room doing the blocking with the TV. But other than that I didn't listen to too much because I didn't want to get too much in my head. NA: Also that's the thing. Those other casts, they found their own version of the show. Our musical director at the beginning was like "I want you to learn it, but whatever you choose to do after that is up to you." I had musician friends of mine send me files of the music that I could sing to, and then I would listen to a cast recording and hear notes that didn't seem right to me. So we found our own versions. It may not be the exact road map, but it's our map to the show. JB: So you had just two weeks of rehearsal? NA: We started learning Act One music on a Monday, we started staging Tuesday morning, and Saturday we did Act One off book. We had Sunday off, Monday we started Act Two, that Saturday we ran the whole show, and then Monday we left for Fayetteville for a week of tech. So it was fast and furious. It felt like the hardest most emotionally demanding summer stock rehearsal process ever. JB: What do you think this show captures, in the Broadway pantheon, that isn't captured by any other show? NA: I think there's a truth to this show that is unlike any other musical in that it presents people honestly, with flaws, and it doesn't try too hard to create sentimentality. It doesn't try too hard to be emotional and say "Look at these hard issues and all of a sudden we're gonna get you with this one." I feel like it presents these damaged, flawed individuals, which we all are. You get through Act One and you're like, "Who am I rooting for? What's wrong with these people? I don't like any of them." In a musical there's usually a clear hero, and in Act One I don't think you know who you want to root for. And the payoff is in Act Two where they all unite and you see the importance of family, and how a tragedy can unite everyone. MVE: I can't think of any other musical to compare it to. It's obviously Sondheim-influenced, but you can't point to anything like, "Oh it's kind of like Gypsy." No... Or, "It's kind of like Sunday in the Park with George." Noo... And William Finn and James [Lapine] have created two completely different acts. A lot of people say they're not really following that well in the first act. JB: The first act feels like really wacky, early 80s off-Broadway. And the second act feels like a cohesive show. MVE: It definitely takes some time. And I play a character who's not totally likable and you can feel that energy from the audience. And I want to be, "Look, I think I'm going to grow. I think you're going to like me, just hang on." The overly stylized way it's told in the first act, and then you have the linear style of Act Two. You get these pieces of their past. You don't totally know who these people are. But then in Act Two you fall for them, and you're moved for them. And that's the beauty of this: We're all sort of works in progress and we're all flawed. JB: I can't imagine having to do it twice in one day. NA: I feel like a dish towel that's been wrung out over and over. But it's so satisfying. It's a dark feeling at the end, you know, to have to shake off. MVE: I had this moment — I'm going to cry talking about it too — I just had this moment with something that's so real that happens in the second act, and I had this moment where I was like, What did it feel like for these guys who buried friend after friend? Not even buried them but sat in hospital rooms and watched them waste away. I've had some things in my life, I've lost some people, but when I say to you I'm feeling it on stage, I'm really feeling it. But what was it like for people to feel this every day for years, in a time when AIDS was just something beyond everyone's control? It's hard to fathom what that was like. JB: You guys got to meet Bill Finn, when he was here for the opening? MVE: He came for some of our rehearsal and he came for our opening. JB: It seems unfathomable that he came up with this musical about that era that is still so funny. MVE: Sometimes the only way to get through it, and the only way to get an audience on board, is to laugh it. The only way to deal with the worst thing in the world sometimes is to laugh at them, to break the tension in real life. It's a way to bring us all together and break the ice, and when you connect with people then you can get down to the real stuff, the serious story. JB: Did you glean anything from talking to Bill? MVE: It was great just to get his approval. NA: He was like [puts on gruff voice] "This has never sounded better." MVE: Nick won't tell you this, but Bill said he doesn't even like "The Games I Play," the song he wrote [in Act One] but he said this is the most he's ever liked it because of how beautifully Nick sings it. NA: I just started crying in front him. I was like "That's crazy." Also I said, "How can you not like that song? I love that song." MVE: You wrote that song and that's incredible. NA: That's a moment I'll never forget. JB: Do you have a favorite song to sing in the show, or does it change? NA: It does change. I love when we're all together. "Unlikely Lovers" for me... I think that song is so beautiful. It's one of the most beautiful songs in any show. People come up to me after the show and say, "That quartet, at the end..."
NA: I also love our duet at the end. MVE: There are very few moments in the show where I'm like "Yay I'm singing this right now," but I look back and that's a very special moment that I share with Nick. I also really love "The Baseball Game" because we're all there, and as the music gets thrown to other characters we all get to ad lib. It's just really fun. NA: A moment of levity in a really heavy night. MVE: It's really rewarding just getting to sing this score. We all have one or two notes in the show where we're like [crosses fingers] Please Lord! but mostly it's just the endurance of it. Having to get through it all eight times a week. But the whole score is written in a really healthy [range] for all of us, and it's just really rewarding to sing it. There are some shows where it's just all these money notes — way less singing, but way more stressful. NA: I was surprised by "You've Gotta Die Sometime." I thought it was going to be so tough to do, and it is. But I've never felt so far removed, like lost in a song, as I do in that song. I feel like I go on this beat-by-beat journey with that song every time, and then I arrive at this place and everyone comes in and it's this crazy moment. It's so heart-wrenching but it's so satisfying to give yourself over to it. And I didn't anticipate that. It's so sad and I didn't think I would feel this way. But as an actor it may be my favorite moment because I feel like I just completely surrender to it. MVE: There's very little in this show that you have to fake or that you have to psych yourself into. If you've got the goods to do it, if you've done all the work and you've got good direction, you just have to start the show and even if I feel pulled out of it emotionally one moment, ten seconds later I'll get pulled right back in. 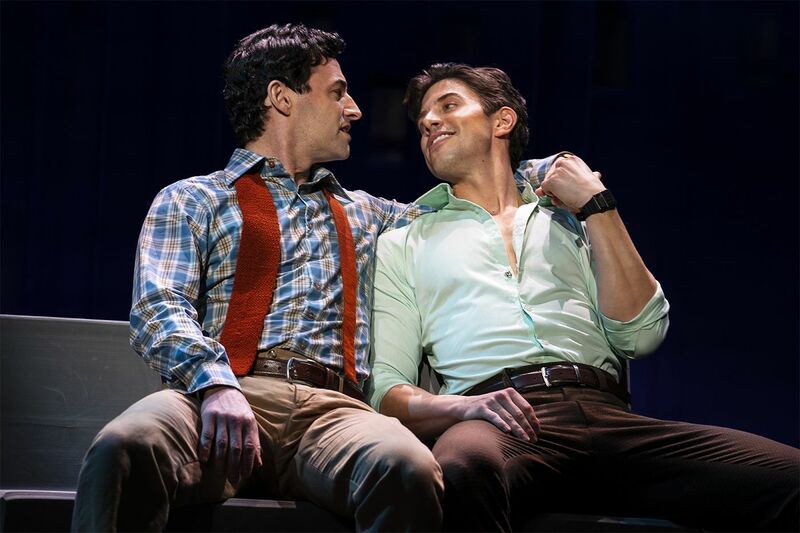 JB: I was thinking, is there another show in Broadway history that has multiple gay love duets like this? NA: Hmm. Kiss of the Spiderwoman? JB: It's just, it's been 27 years since this was originally on Broadway, and there hasn't been a show since? MVE: It's wild. It was so ahead of its time, and yet right on time in so many ways. But yes, this isn't totally a mainstream show. It's part of the Broadway canon, but people who see one or two shows a year may not have heard of it. But it's still so important to people. It's still speaking to audiences. I had guys come up to me after the show just last night and they were well into their sixties and they said, "Thank you for telling this story. I lived this." And I said, "I can't imagine what it was like to live this." And we have 15-year-old trans kids come up and say, "Thank you for telling this story." And they're not being specifically represented in this show but they see diversity on stage and they're like "You don't know what it means." It's important for people to see diversity on stage. And somebody might think this is some kind of period piece like, "Oh, look at that show from the 80s," but it's not. NA: When I saw it, I didn't think it felt like a period piece at all. It really holds up. MVE: I get the feeling of the period in Act One, but I get lost in Act Two. JB: Have either of you ever performed in San Francisco before? NA: I've done concerts here. My partner Kyle was on tour here in Wicked, and I came to visit. I was in Wicked, but not here. And I've done concerts at Feinstein's [at the Nikko]. JB: What is your impression of SF audiences, so far? NA: They're not like easy audiences who'll just laugh at anything, but I can tell they're leaning in and paying attention. MVE: They kind of make us work for it, but I can tell they're savvy theater-goers. They don't leap out of their seats for just anything or applaud for just anything. This feels like a theater town full of people who know what they're seeing. And you can't fool them. NA: We've had a good mix of the LGBT community coming to see it. I just wish there was a little more [marketing] presence in the Castro area because I feel like people there may not know it's happening. JB: Well to your point, it's not a show that too many people outside the New York theater world really know about. It's basically never been outside of New York, and it's a very New York play. NA: I've had people be like, "Falsettos. So it's some kind of singing group?" I've had five separate people ask that. Like, "So you sing in your falsetto the whole time?" No. 'Falsettos' plays at the Golden Gate Theater through April 14. Find tickets here.